Infrared thermometers - The RayTemp 3 infrared thermometer is compact, lightweight and easy to use. 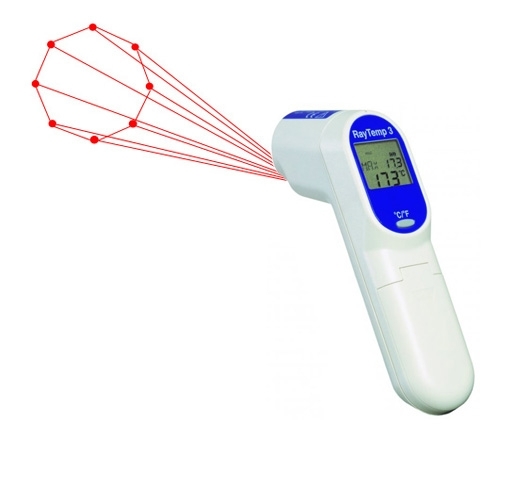 Simply aim, press the button and display the temperature of the item being measured. In addition the LCD will display the maximum temperature. The RayTemp 3 infrared thermometer measures temperature over the range of -60 to 500°C with an assured accuracy of ±1°C over the range of 0 to 65°C, outside of this range ±2°C of reading in an ambient temperature of between 15°C and 25°C, with a repeatability of ±1°C of reading. The Raytemp 3 infrared thermometer incorporates a clear, easy to read, LCD display with low battery, laser and backlight indication and an auto power off facility that turns the instrument off after 15 seconds, maximising battery life. The RayTemp 3 is ideal for measuring food surface temperatures, eliminating the need to touch or contaminate the food you are measuring, avoiding the risk of cross-contamination. The unit can be used by anyone as there is no need to focus or adjust the instrument. Each RayTemp 3 features a single push button, allowing the user to select °C or °F. The thermometer also incorporates an 8 point laser assisted alignment as standard, to assist in pin-pointing the area of measurement. The unit incorporates an 11:1 optic ratio (target distance/diameter ratio) and a fixed emissivity of 0.97 making it more suitable for chilled and frozen foods, although this infrared thermometer can be used for a wide range of other applications.